Sometimes you think you have the ingredients you need and then you cut into something and discover you need to rethink things on the fly. I hate onions, garlic, and linguiça sauteeing for a Caldo Verde when I discovered only a couple of my potatoes were any good. I suppose this is why you are supposed to do mise en place before you cook one thing, but I chop while I cook and probably always will. Okay, time to cook on the fly. 2 linquiça sausage sliced into 1/2 slices. I turned on the oven to roast some root vegetables rather than boil potatoes. 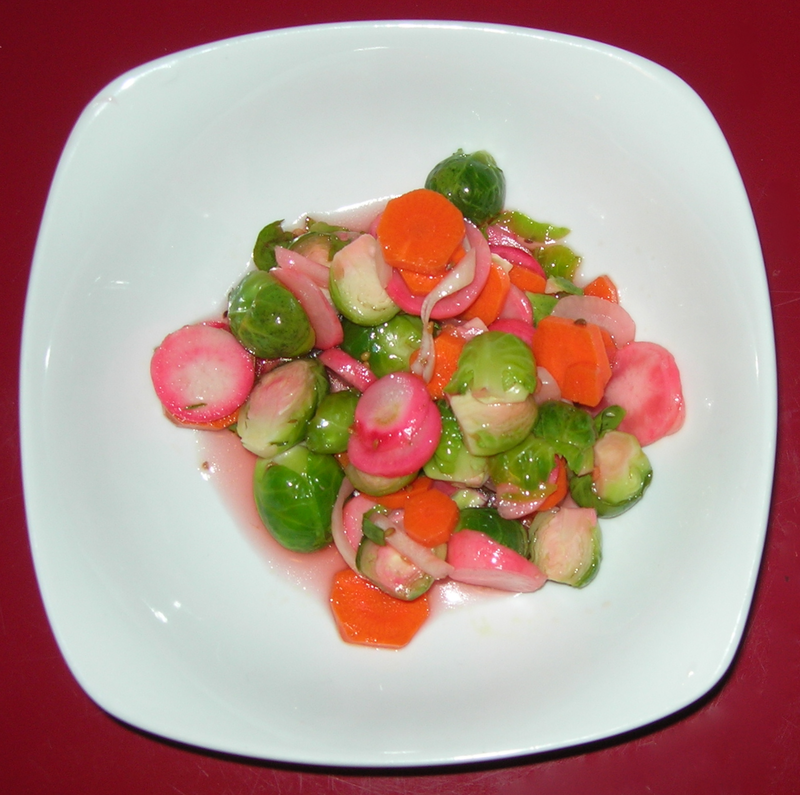 So, I decided to use rutabaga and thought I needed a brighter flavor. I added diced tomatoes and added the same amount of water as I added tomatoes. (I filled the empty cans, shook them a bit, so everything dumped into the stock pot.) I turned the heat to a low simmer. Meanwhile. I tossed the chopped rutabaga, carrots, and potatoes in a roasting pan with 1 TBSP of olive oil and a sprinkling of kosher salt. I roasted them at 450°, turning them after about 15 minutes. After about 25-30 minutes they were tender and browned. The tomato sauce/soup has been simmering away very slowly for about 30 minutes. I added the kale and let it wilt in the soup until tender, about 5 minutes. I then added the roasted vegetables and added a bit of salt and pepper to taste. This is definitely something to make again and again. It has a bright, fresh taste with just the tiniest bit of heat. The carrots balance the rutabaga with a bit of sweetness, the linquiça is amazing as always, and the tomatoes and kale are made for each other. 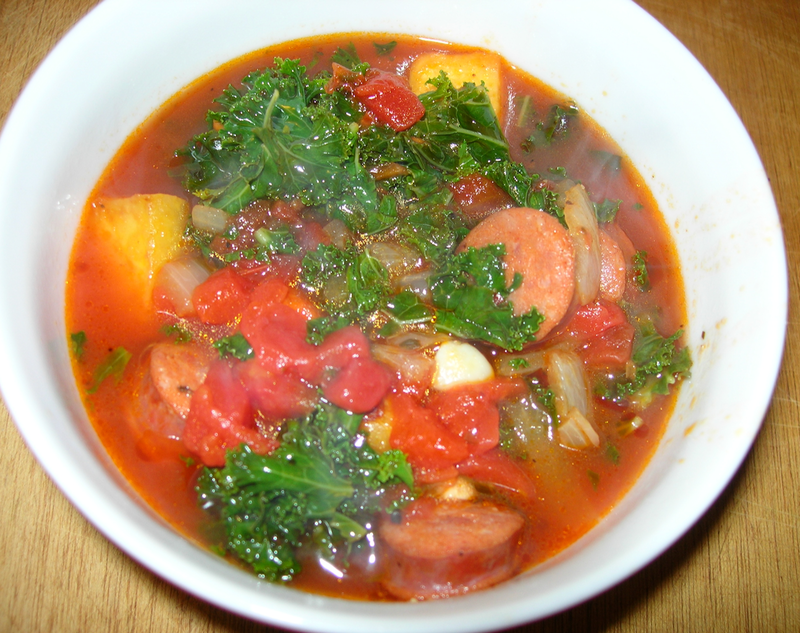 It’s a delicious soup, a bit lighter than Caldo Verde, and beautifully vibrant. This made 8 servings, but that means 8 meals of progressively more flavorful soup since it always is better the next day. The best way to cook vegetables is roasting. 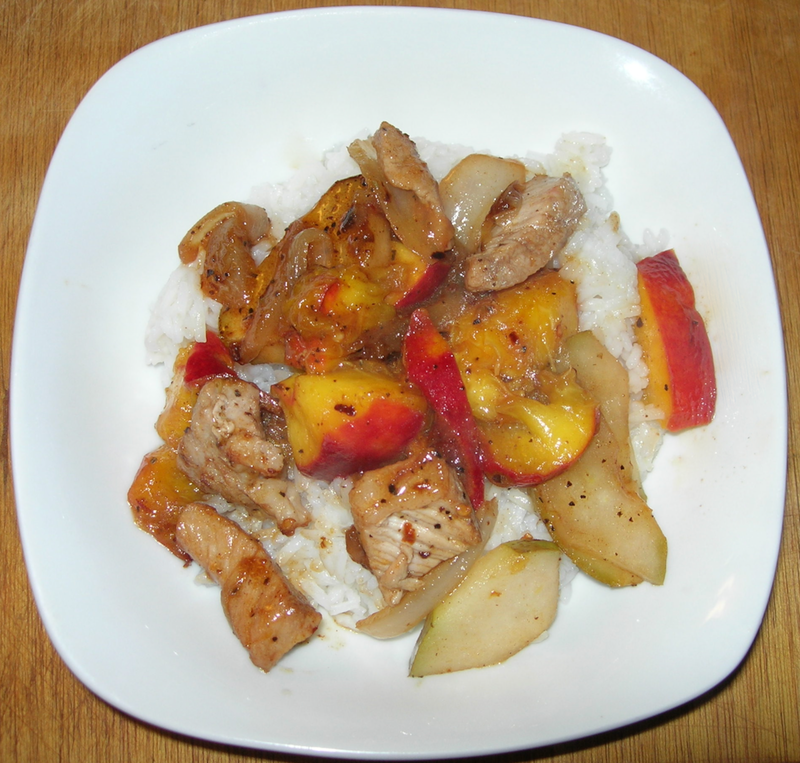 They retain their flavor and get a bit of flavor emphasis with caramelization. It’s popular to melt a little cheese on top but that seems a bit heavy for lunch. I like the contrast between hot veggies and cool, fresh, and light sour cream. 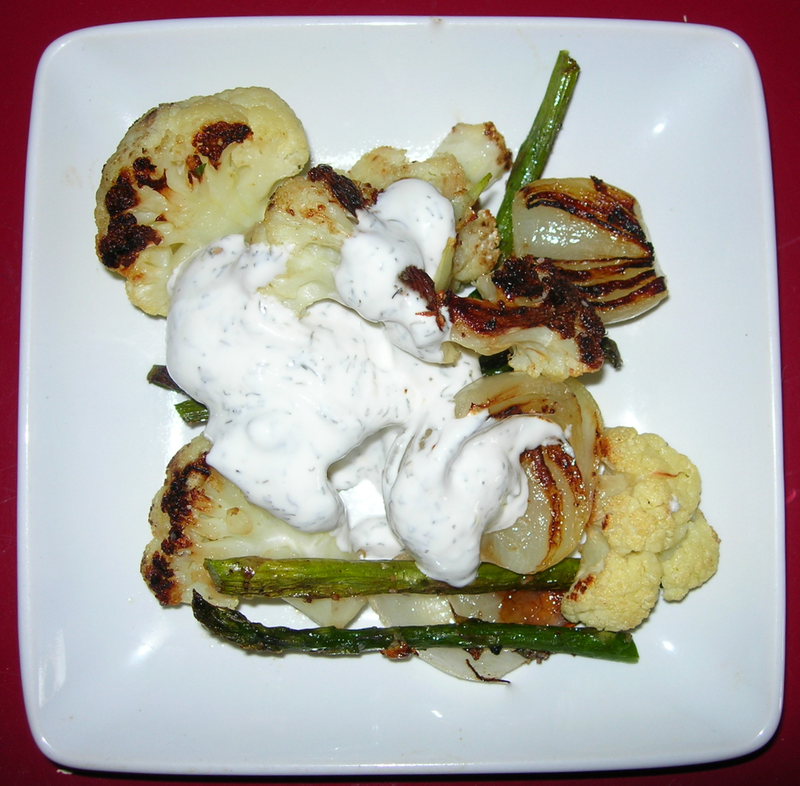 Toss six cauliflower florets, 2 very small onions cut in half, and 3 slices of asparagus cut in half. Toss a little olive oil and sprinkle with salt. Rub the oil all over the veggies so they are coated. Roast 20 minutes, turn oven to broil for 5 minutes so the veggies are all browned beautifully. While roasting, make a sauce with 1/4 cup of sour cream, the juice of half a lemon and some dill weed (to taste), add a bit of salt and pepper. Roasted vegetables are the best, a light, cool sauce is a delightful contrast. It’s also super easy to make. My best friend makes this for Thanksgiving every year, but this year she was deep in roasting lamb, making brioche, and baking pies and brought the ingredients over with her recipe and said, “Here.” Well, not quite so peremptorily, but you get the idea. Knowing that her lamb is the most delicious dish that has ever existed on the planet, I was happy to help. 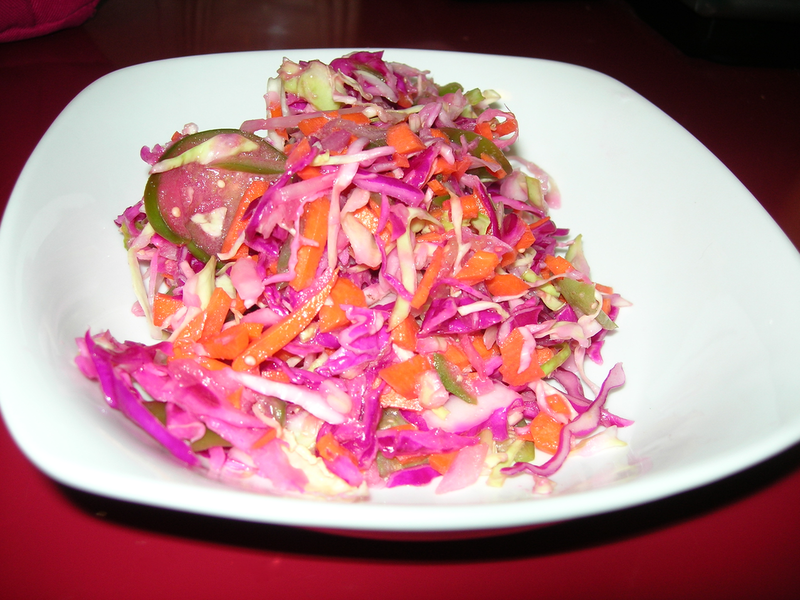 Besides, my contribution was two pickled salads that I had made the day before so the brine could work its magic. 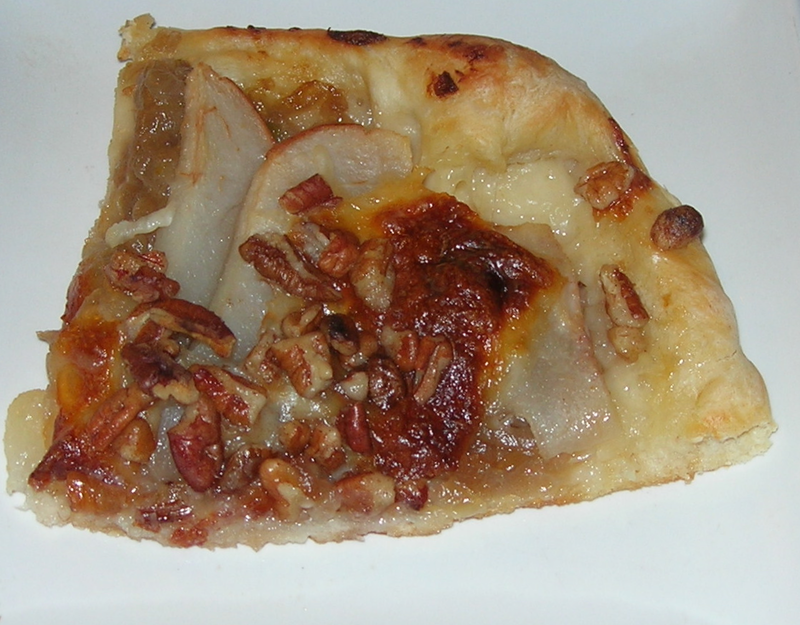 This is a recipe that originates with Nigella Lawson and was printed in The New York Times years ago. It has been a tradition ever since. 1 serrano pepper – don’t remove the seeds, you want the heat. 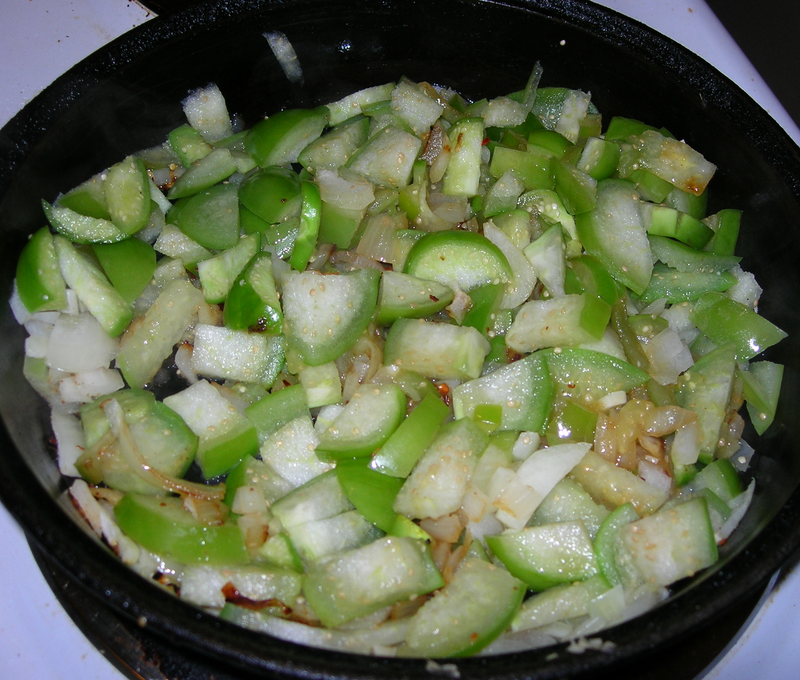 Chop onions, garlic, serrano pepper, and ginger. Sauté in canola oil over medium low heat for about 5 minutes until softened. Add spices, stir and mix. Let bloom by heating so the aroma fills the room. This releases the aromatic oils so they infuse more flavor. Add sweet potatoes and stir until covered by spices. Add coconut milk. Raise heat to medium and simmer. Heat broth and stir tamarind paste in hot liquid until dissolved (You can use a microwave). Tamarin paste is super sticky, so you want to be sure it is completely dissoved in the hot liquid before you add it to you pan of simmering sweet potatoes. Keep simmering, partially covered for about 25 minutes. You want the sweet potatoes to be tender, but not soft. Add the chickpeas, stirring them into the sweet potatoes and making sure they heat through. Then remove. Top with cilantro when serving. This is a warm, slightly spicy dish rich in the hearty, warm flavors of fall with the beautiful browns and oranges of fall as well. It is delicious, hearty, and a great substitute for the traditional mashed potatoes and gravy. It is a huge meal, serving 12, or great for leftovers. It just tastes even richer the next day. This took less than five minutes to make. I heated two pans on the stove, one set at about 4/10 and the other at 6/10 on the heat dial, a low and a high medium. In the low medium, I added no oil at all. I put about 1/4 of a small onion cut in thin slices and about 1 cup of chopped kale, chopped up. I added a bit of salt and pepper and a few red pepper flakes. I squeezed the juice from half a lemon on it and let it cook. I did not want it to get overly cooked, just warmed. When the kale was about half done, I melted 1/4 tsp of butter in the other pan and cracked an egg in the melted butter. I added salt and pepper, and let it cook for a minute. I put the tostada on a plate, spooned the kale and onions on the tostada, then I flipped the egg for a few seconds and placed the egg on top of the kale. When eating, I broke the yolk right away so it blended with the kale and onions. The kale alone tastes too strongly of the lemon juice until you mix the egg yolk…and then it’s a perfect lemony sauce . 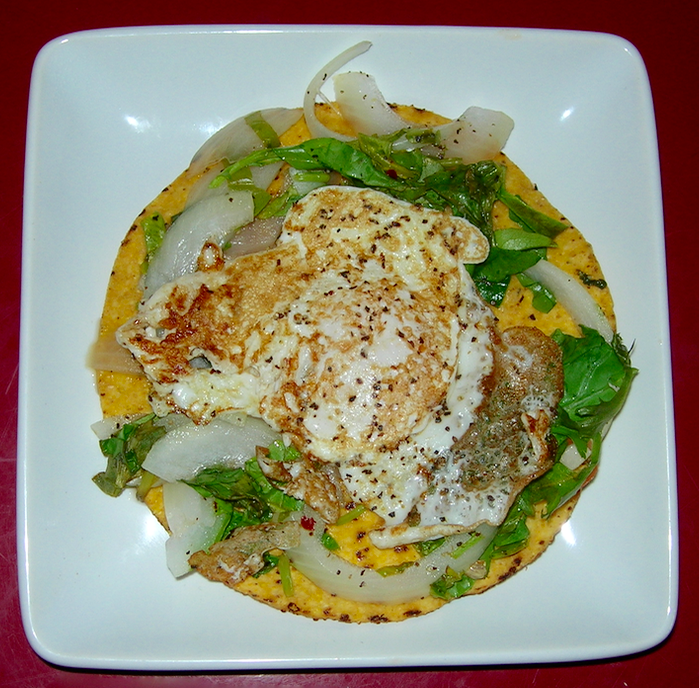 This is a pleasant mix of textures, soft creamy eggs, crunchy tostada and soft, but still toothsome veggies. The egg yolk and lemon are a light and creamy sauce for the salty tostada and the sharp onions and slightly bitter kale. It’s fast, easy, and delicious. Yesterday I got about 5 pounds of tomatillos from Harvest Share. I had eaten them before but never cooked with them. Last night I made a quick stir fry with them that was tasty. Seeing how they cooked, I wondered if they might work for a shakshouka. No harm in trying, right? Well, I tried it. I liked it. I will make it again. Shakshouka made with tomatillos is very different, but still very good. To make the shakshouka, I heated my pan to medium, added 1/2 tsp of cumin and 1 tsp of red chili flakes to my dry cast iron man and let them toast for a couple minutes, just long enough to make the air fragrant. I then added 1 TBSP of olive oil and 1 cup of chopped yellow onions, and 2 cloves of garlic and sautéed until the onions were tender and turning transparent. While they cooked, I chopped up 6 small tomatillos. 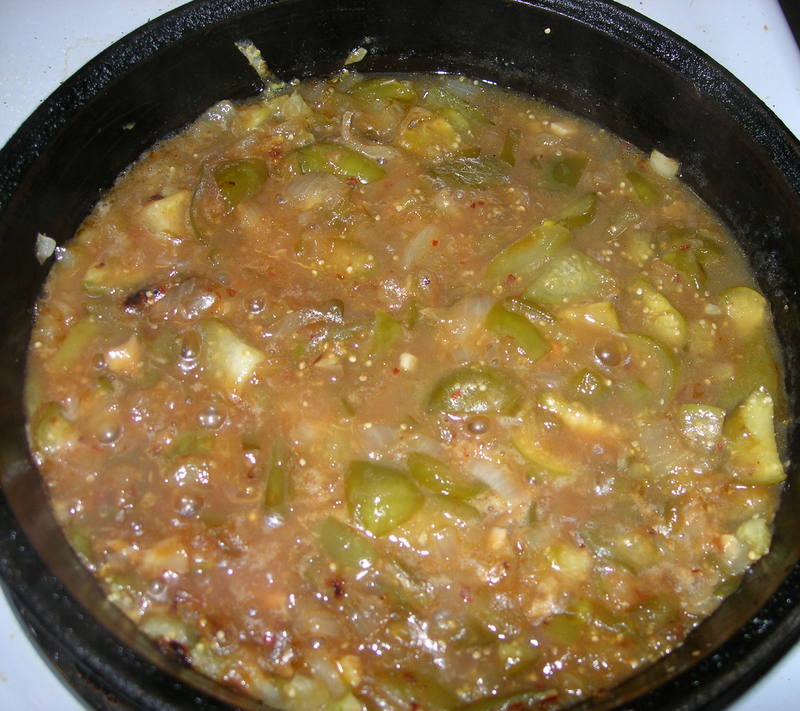 I added the chopped tomatillos and let everything simmer until the tomatillos cooked down. I squeezed juice from one lime to make it zing. After about 10 minutes, I added 1 cup of water and stirred. 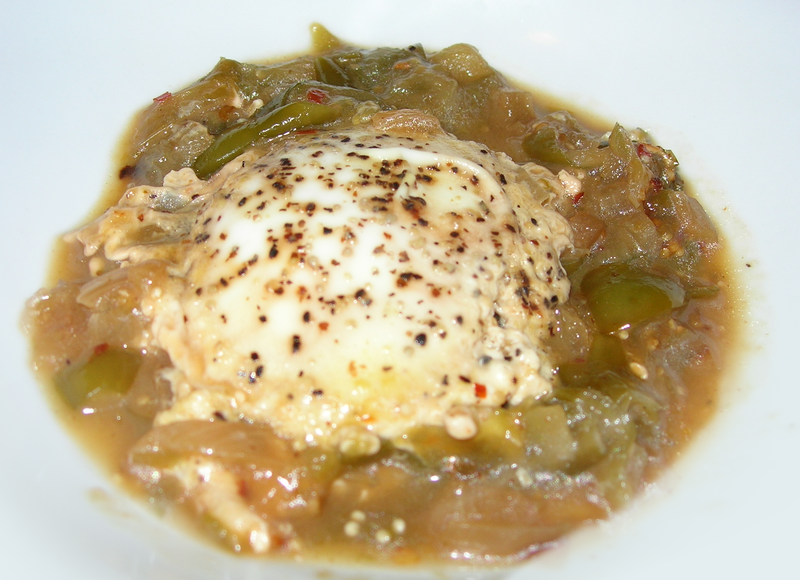 When the tomatillos were broken down into a sauce, I cracked four eggs on top to let them poach. To be on the safe side, you can crack your eggs into a small bowl and slide them into the liquid to avoid breakage. I find that if I crack them on a flat surface, I don’t break the yolks and I don’t get shells falling into the dish either. Add some salt and pepper to the eggs. I let them poach for a few minutes, covering them for the last minute to make sure they cook thoroughly, though not so the yolks get hard. So this made four servings, or two with 2 eggs. There is a delicious tartness to this shakshouka. There’s gentle heat from the pepper flakes and some delicious umami from the the eggs. It was delicious and I will definitely make it again. So, you can make grits ahead of time if you like and even make a big batch of grits in advance, or you can make a single batch for just this dish. Today, I made one serving, so I brought 1 cup of water with a dash of salt to a boil and added 1/4 cup of corn grits. Stir the grits in the boiling water for a couple minutes and then cover, turning heat down low for 15 minutes. If your pan is thin, check on it and stir frequently. If you have a big thick pot, you can just leave it and it will be cooked to perfection without sticking. a minute or two then add 1 TBSP of rice vinegar. Let cook. Poach an egg. You can either drop it in boiling water that you swirl to make centrifugal force keep it together or you can poach it in a microwave. Add about 1/2 cup of water to a bowl. Crack you egg into the bowl. It must be submerged under the water, but to be on the save kid, prick it with a toothpick or the tip of a knife anyway so it does not explode. . Cover the bowl with a plate. Microwave for about a minute. Keep an eye on it, sometimes it will be done in 40 seconds, sometimes a minute. I have poached dozens of eggs in the microwave and each egg seems to need their own time somewhere between 40 and 80 seconds. Spoon the grits in the bottom of a bowl. 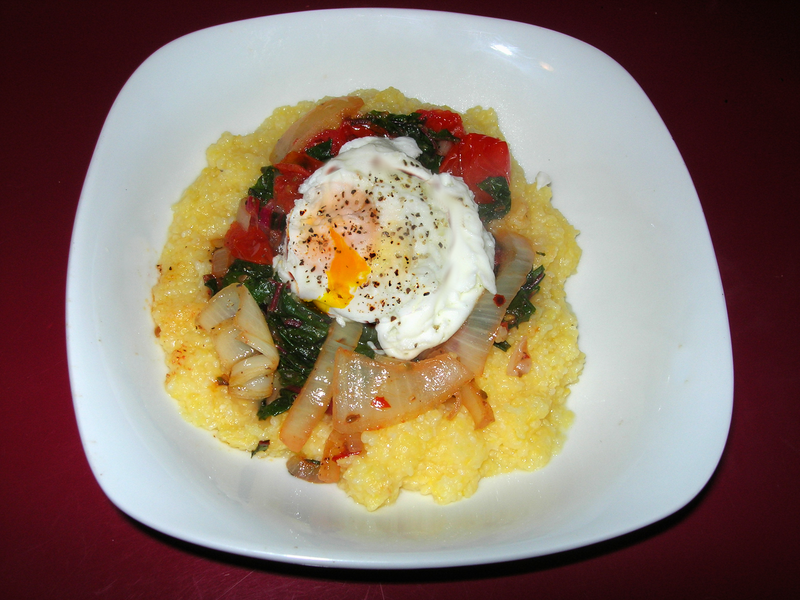 Add the cooked chard, Place the egg on top. The yolk mixes with the vinegar and oil of the veggies into the luscious creamy, tangy dressing with the perfect blend of heat and bright tang.